Most marketing executives understand that quality entertainment can be used to sell a consumer almost any product or service. And while any skilled producer can create a spectacular show, few have the ability to infuse the entertainment seamlessly with a strong corporate marketing message. Fusing the gap between entertainment and brand identity has long been the forte of the late event producer, Bob Talmage whose company Bob Talmage Associates lives on producing live events and spectacles. Their accomplishments include introducing events, products and services to the trade and consumers for brands like Nike, Skechers and Sun Microsystems have earned them a place as a leading producer of live entertainment and corporate theater. Bob Talmage, an executive producer, director and choreographer, died March 25 of cancer at Cedars-Sinai Medical Center in Los Angeles. He was 59. 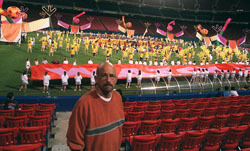 Fusing the gap between entertainment and brand identity has long been the forte of live event producer, Bob Talmage. His accomplishments introducing apparel and high-tech products to the trade and consumers for brands like Nike, Skeechers, FIFA and Sun Microsystems have earned him a place as a leading producer of live entertainment.